After almost forty years, John Hart’s second poetry collection, from Sugartown Publishing, joins its predecessor The Climbers (Pitt Poetry Series 1978). “The tough-mindedness and technical excellence of thee poems demand and deserve discriminating readers,” Library Journal said back then. Like the former book, this one is pervaded by themes and images from the world of rock climbing and alpinism; also like The Climbers, this one reflects a commitment to the poetic tradition known as Activism, growing out of the group around John’s father Lawrence Hart. I have been asked to say something about the two worlds from which these poems come: the strange realm of climbing and mountaineering, and the stranger realm, relative to contemporary norms, of what is called Activist poetry. The first is easily dealt with. About the time I was finding my feet as a poet, I was getting hooked on the sublimely pointless pursuit of technical climbing: big mountains (though far from the biggest); challenging routes up cliffs (though far from the most daunting). This development was quite unexpected, even inconvenient. The time it involved! The expense! exogenous entry and was immediately whole . . . Though the majority of my poems are not about climbing, images from that world pervade them, as they pervade my dreams. Some readers have complained of this mania; in this book I have accepted my editor’s counsel to go with it, giving the more literal “climbing poems” pride of place. So much for what I so often write about. The way I write it needs more explanation. My mother was poet Jeanne McGahey; my father, Lawrence Hart, was a freelance intellectual and mentor of a group of poets who had become known as the Activists. Every couple of weeks, throughout my childhood and adolescence, these poets convened at our cottage (it was no more than that) in San Rafael, north of the Golden Gate, to write and talk and laugh and subject themselves to criticism, mostly from Hart, that was both kindly and quite merciless. These meetings had been going on in one form or another since the 1930s, when Hart, without credential other than his own prodigious reading, began teaching creative writing under a New Deal make-work program. That pre-war decade was an exciting time for poetry–“the poets exploding like bombs,ö as W. H. Auden put it–and the heyday of “High Modernism.” Hart was determined to understand what these still unequaled poets were doing, and, so to speak, to reverse-engineer their best work: to derive techniques that could be imitated, taught, and built upon. As Hart’s more advanced students developed their reputations, they began presenting themselves as the Activist Group. The rubric had nothing to do with politics but came from their shared intention to write poetry in which every line was somehow poetically charged, heightened above ordinary speech, active. Growing up in this environment I was doomed, I suppose, to catch the bug. I recall being crushed when, in the third grade I believe, I brought home a bit of doggerel about lands where the wind doth blow and the cotton doth grow, only to be very gently advised that this would not do. But if I really wanted to begin to write verse, they could help . . . .
Don’t think a second dream will take you back. you do not have the power to relent. Your omen has diminished and must fall. uneasily forgotten since the road. 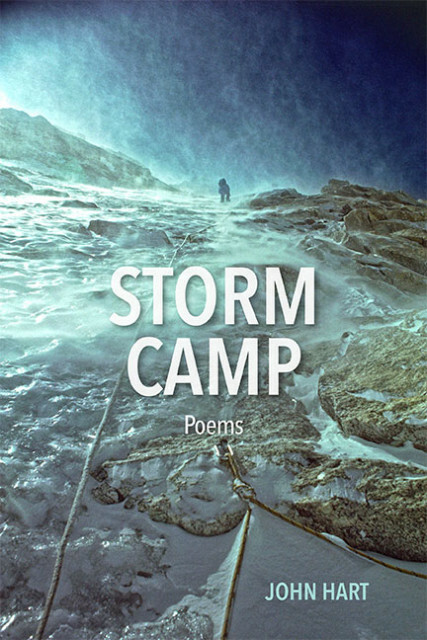 Traveling through the pages of John Hart’s Storm Camp, you breathe always the cold, thin air of high places. Something in Hart is ever the climber, whether his poem is crafted in free verse, sonnet, rhymed couplets or Chinoiserie. His cadenced lines are uniquely his own, employing the sprung rhythm of Hopkins, inversion, alliteration, internal rhyme and half rhyme. The poems resonate with mystical insight and deep humanity, the pathos of this life and the promise, not too firmly rejected, of another. I could not read these lines at first, their pith and density. I had to go away and return. . . . The more I read, the more humbled and exhilarated I get. These fine poems cut a broad swath. At the level of phrasing, Hart consistently and willingly pushes every idea higher and farther in poems that address the place of humans among the animals, as well as poems that consider the place of climbers on a mountain. The poet understands the all-importance of structural integrity, whether it’s translation from Rilke’s German, the steep rise of the sonnet, or the ring and echo of iambic pentameter. Hart’s poetry is built for the distance. Using fully the complexities of his language, John Hart demonstrates that the highest purpose of literature is to illuminate those things which are hard, disturbing, painful, moving, and repeat themselves, not to obscure them. He is one of our finest poets.